HONG KONG—Two men were arrested and one left in an ambulance, after they came to toss smelly animal organs at the media mogul Jimmy Lai, seated at the main pro-democracy protest site near government offices here. It was the first notable instance of violent conflict at Admiralty, where the government headquarters are located, and where thousands have set up a six-week-long encampment over the roadway calling for greater democracy. According to Ma Kee, a 60-year-old volunteer at the “Democracy Stage,” which invites speakers to engage with the crowd, the three men came after 4 pm in the afternoon. They threw the internal organs at the tent, then quickly departed. Less than a minute later they were back for another attempt. “I saw two persons carrying a small luggage bag standing there. These two men were there, and another stood to take photos. Then I suddenly saw the organs thrown at Mr. Lai.” Lai was hit with the offal and possibly more, as photos online demonstrate. The second time volunteers nearby rushed to restrain them and bring them to the ground, binding their feet and hands with plastic zip ties and holding them down on the asphalt until the police came. One of the organ tossers, or perhaps their photographer, sustained superficial head injuries during that altercation and was loaded into an ambulance. The rationale for the precise choice of projectile was unclear. A young man who would only be identified as “Dozy,” who said he had been at the site “since day one,” said that what appeared to be human excrement was also thrown. “It’s very smelly over there,” he said, pointing. A senior police officer, who would not provide his name, said that it is “theoretically possible” for the volunteers to have made a legitimate citizen’s arrest in the manner described. But he stressed that once the assailants were restrained, it would not have been permissible for the protesters to have used further force. Internationally acclaimed novelist Haruki Murakami sent a message of support to Hong Kong student protesters at a literary prize acceptance speech in Germany. 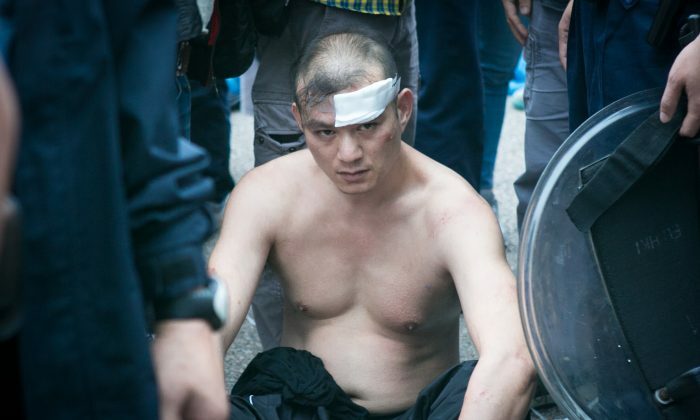 Here's how the Hong Kong police might clear the Occupy Central demonstrators. Chinese Communist Party chief Xi Jinping called Hong Kong's democracy protests illegal, and cautioned foreign governments from "interfering," while calling for the maintenance of public safety.